National Food Day was today, October 24, 2011. It is a day to recognize healthy food, to support healthy farming, nutrition and good eating habits. So today at school, I brought in a snack to share with my class. 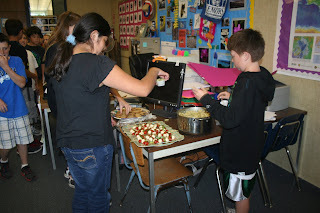 It was pasta with creamy pesto sauce, "Simpson Skewers" and homemade chocolate chip cookies. I made the creamy pesto by first making a roux. A roux is melted butter, flour to form a paste and then you add milk to make the cream sauce. I then added homemade pesto from basil from our garden, salt and pepper and a hint of truffle salt. The Simspon Skewer is a fresh mozzarella ball, basil from the garden and a cherry tomato skewered on a fancy toothpick. I drizzled a balsamic dressing over them and some salt and pepper. This is one of my favorite snacks. My mom made chocolate chip cookies using our family secret recipe. National Food Day is a day that helps me appreciate the food you eat, food that comes from the garden, from local farmer's and is healthy. I am not a fan of using processed foods like American cheese. It's disgusting. I was able to make this snack for my class from scratch and show that even I can cook and make a healthy meal. All kids should help out in the kitchen and ask your parents if you can cook. You might make a few mistakes, you might make a mess, but that's how you learn. So go out there and cook with your family or for your family. Check out the local homegrown places like Victorian Farmstead, Stemple Creek Ranches, French Garden Farms, Laguna Farms, all the farmer's markets. You'll love it like I do.